Palak Paneer or spinach with cottage cheese needs no introduction, a hot favourite among north Indian cuisine and is present throughout the country in its different avatars. This Traditional Dish with right spices and a touch of fenugreek recreate this evergreen favourite perfectly every time. 1.Break palak leaves from the stem.Discard stems.wash in plenty of water.Keep aside to drain. 2.Heat oil in kadai.Add brown cardamom ,laung,and pepper cons. 3.Add chopped onions and cook till light brown.Add ginger,garlic and green chillies.Stir on low heat for 1 minute.Add kasoori methi.Add garam masala,red chilli powder,amchoor powder and salt.stir on low heat for 1 minute. 4.Add spinach and cook uncovered for 10-12 minutes on low heat.Remove from heat and let it cool. 5.Blend the cooled mixture along with 1/2 cup water,just for a few seconds,to a coarse paste.Do not grind it too finely. 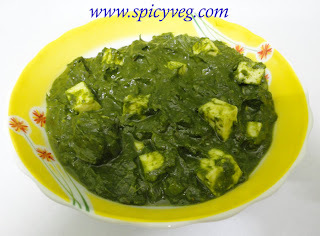 6.Add 1 cup water and paneer pieces to the spinach paste.Cook on low heat for 2-3 minutes till paneeer turns soft.check salt.Add sugar.Remove from heat.transfer to a serving dish.